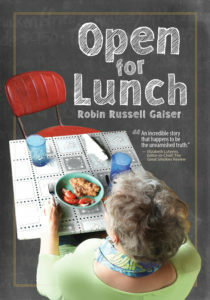 The official launch of Open for Lunch, the new memoir by Robin Russell Gaiser (author of Musical Morphine: Transforming Pain One Note at a Time), will be held November 16 at Malaprops Bookstore/Cafe at 55 Haywood Street in Asheville. Enjoy browsing and refreshments beginning at 5:30 p.m., and Robin will read beginning at 6, after which we’ll enjoy your questions and discussion about the book. Preorder now, or buy your copy at the reading.